Freight applies after purchase. Call us at (800) 274-8730 for a freight quote. Warning: In order for the Fig. 922 to function properly, all emergency vents, fill connections, tank openings and piping connections must be airtight. Emergency vent should be set at least 2 oz. higher than the Fig. 922. The Fig. 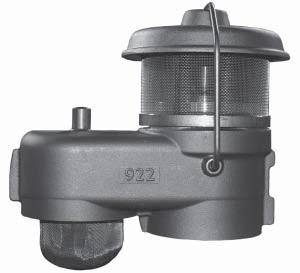 922 Combination Vent/Overfill Alarm is a fully mechanical, high intensity audible alarm that alerts you when your tank is near full while also allowing your tank to breathe during filling and dispensing operations. The unit is equipped with a whistle which incorporates a 2� or 3� full port pressure/vacuum vent. The unit can be set to activate at 90% fill height by adjusting the cable length to the fl oat device. The adjustment tool is provided. The unit attaches to a 2� or 3� N.P.T. pipe mounted on the tank. Minimum fi ll rate for alarm to operate is 20 GPM. Note: Not for use on vapor recovery systems. Pressure Poppet Setting: 8 oz.